CAS® Slingers Expand Geographical Footprint for Singapore Container Port Project! Singapore Container Project to get a huge boost with CAS Slingers! CAS Slingers were the ULTIMATE SOLUTION! About the project: The Singapore Container Port project is a multi-year/multi-phase project to reclaim land for the expansion and construction of new shipping container ports, which is the primary industry for this small island nation. Currently, the project contractor operates (3) CAS® AT7’s and (2) CAS® TR20’s, which operate 24/7 moving 8,700 cubic meters of sand every 24-hours. 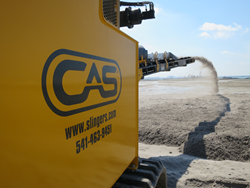 Conveyor Application Systems (CAS®), based in Eugene, Oregon, is a leading manufacturer of on-road, off-road, and reload “Slingers” in the world and is the only Slinger manufacturer located in the United States of America. Keneric Group, http://www.kenericgroup.com.au, is based in Wangara Australia and is a well-established in the heavy-equipment industry. Keneric’s commitment to customer-service is second to none and they are a committed partner of Conveyor Application Systems. Oryx Consulting, http://www.oryxcon.com, has extensive experience with heavy equipment and are experts in heavy construction project management. Finding solutions to complex problems is what Oryx does best! For more information, contact Conveyor Application Systems CAS®, or visit us here at, http://www.slingers.com.